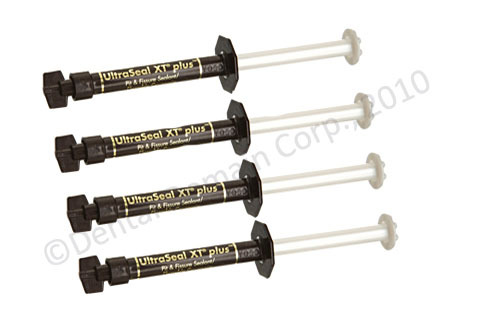 UltraSeal XT plus is a light-cured, 58% filled resin, which makes it a stronger, more wear-resistant composite sealant. Because it is significantly filled, UltraSeal XT plus has less polymerization shrinkage than competitive products. The spiral brush action of the tip causes shear thinning of the filled, thixotropic UltraSeal XT plus, thus dropping its viscosity as it is placed. Resin firms when shear thinning ceases (placement complete) and helps prevent resin from running before it can be light cured. Significantly superior to other sealant materials.